Seth spent an hour with the members of Oklahoma Atheists as the evening's featured speaker. 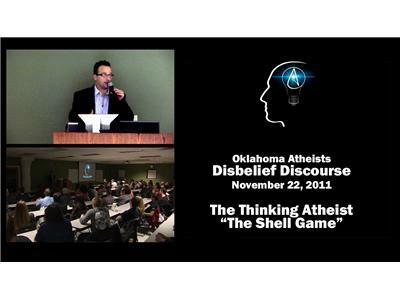 In his presentation entitled "The Shell Game," he addresses the doubles standards and parlor tricks Christianity and other religious use to justify often contradictory, immoral and often ridiculous behavior. Obviously, the radio listener will miss the PowerPoint slides and visual cues in this speech, but most of it translates to the radio format.